There are over 1 million residential solar systems in the United States. Some states have more installations than others, but the growth is happening all over the country, including states not typically considered sunshine states, like Massachusetts and New Jersey. As a real estate professional, there is a good chance that you have already encountered a solar installation, perhaps in a transaction, an MLS listing, or even in your own neighborhood. If you haven’t yet, with the growing residential solar energy market, you will likely come across a solar home soon. Real estate professionals who understand the basics of solar and know how to market the benefits of an installation will have a market edge. For most real estate agents and appraisers, assessing the value of solar is a new frontier. Selling the Sun: Establishing Value for Solar Homes, an online Continuing Education Course presented by the U.S. Department of Energy and Elevate Energy, can help. This class is the result of a collaborative effort led by Elevate Energy through a grant from the U.S. Department of Energy SunShot Initiative, a national effort that aims to drive down the cost of solar electricity and support solar adoption. Elevate Energy is a mission-oriented organization working to deliver smarter energy use for all. Elevate Energy designs and implements efficiency programs that lower costs, protect the environment, and ensure the benefits of energy efficiency reach those who need them most. 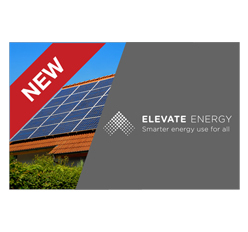 Learn more at www.ElevateEnergy.org. This course is currently in application process for national CE Approvals. Check back here for approvals starting August 2017.